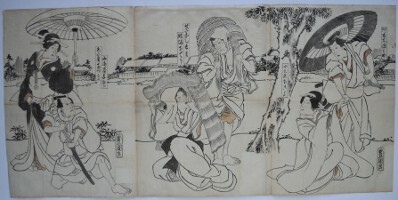 An original hanshita-e (preparatory drawing) for a triptych showing, from the left, Nakamura Kamenojo I as the geisha Azuma standing above Kawarasaki Gonjuro I as Yamazakiya Yogoro, Bando Kamezo I as Settanaoshi Chogoro standing above Onoe Kikugoro IV as Kumasaka Ocho, and Onoe Kikugoro IV as Akogi Gennojo standing above Onoe Kikujiro II as Onnadayu Okoyo. The play was Yume musubu cho ni torioi performed at the Ichimura-za theatre 3/1856. These first drafts by the artist themselves survive because a more detailed drawing was needed by the blockcutter, and this was normally given to an assistant to execute. Or the drawing was never taken up by the publisher, for whatever reason. Sumi and touches of red with some pentimenti. (This was also most likely a published print by Sanoki as it is from the same group as others offered here.) Signed on two sheets Toyoukuni ga.
An original hanshita-e (preparatory drawing) for a triptych showing, from the left, the actor Bando Takesaburo I as Nagoya Sanza, Ichimura Uzaemon XIII as the Shinzo (“courtesan’s apprentice”), and Nakamura Fukusuke I as Fuwa Banzaemon. This is actually from the dance Sanpukutsui Kabuki no irodori performed at the Ichimura-za theatre, 5/1855. The publisher was Sanoki. These first drafts by the artist themselves survive because a more detailed drawing was needed by the blockcutter, and this was normally given to an assistant to execute. Or the drawing was never taken up by the publisher, for whatever reason. Sumi and touches of red with some pentimenti. Signed Toyokuni ga on the three sheets. Sold “as is” with all imperfections. An uncut fan print showing the actor Sawamura Chojuro V as Ono no Tofu (aka Ono no Michikaze) in the play Ono no Tofu aoyagi suzuri performed at the Ichimura-za Theatre, 3/1850. Shows the character holding a large umbrella. 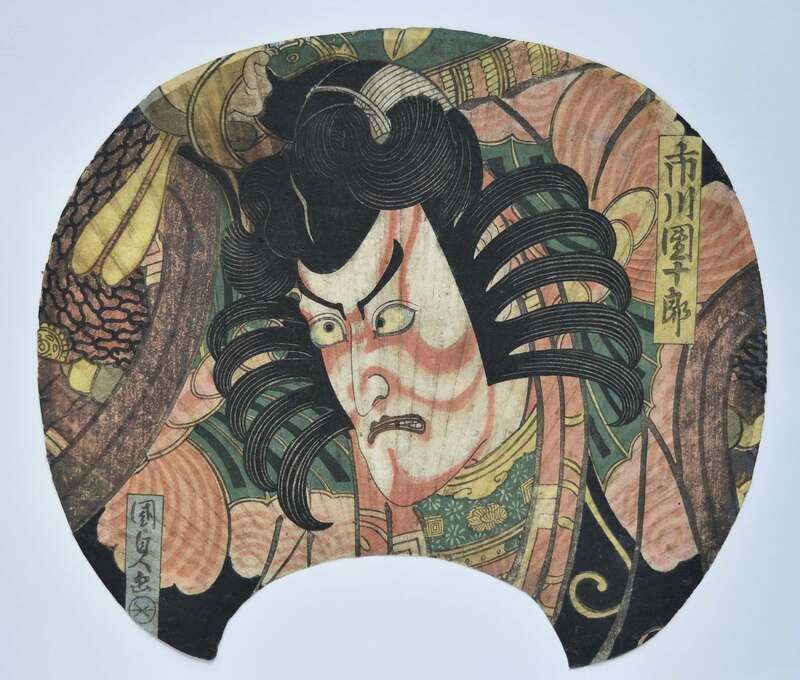 Published by Ibaya Senzaburo, 1850 (who seems to have specialised in fans). Extremely fine impression and colour with extensive burnishing. Minimal soil at bottom, otherwise fine condition. Signed Toyokuni ga. Very fine impression and colour. Slightly trimmed at bottom, otherwise fine condition. Signed Hiroshige ga and Toyokuni ga.
A sheet of original drawings being hanshita-e for an ehon. 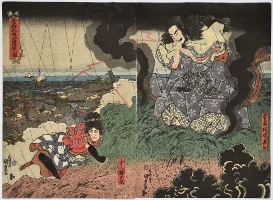 Shows, above, a seated samurai and a female figure to the right holding a mirror. Below, actors in a garden setting. Sumi with touches of red on thin paper laid onto thicker Japanese paper, 14 x 10 in; 36 x 25 cms. Sold “as is” with all imperfections. 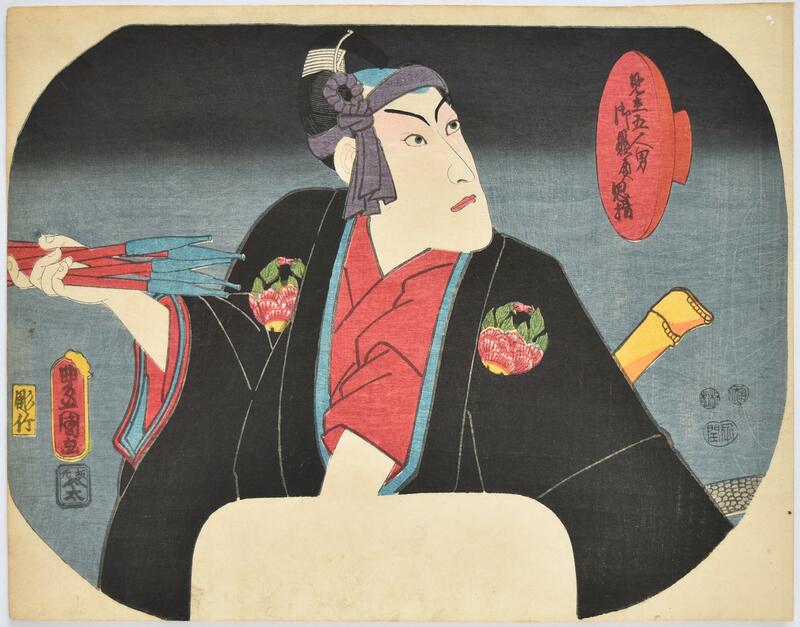 An uncut fan print showing the actor Ichikawa Danjuro VIII in the role of Hanakawado no Sukeroku from a set: Mitate gonin otoko go-hiiki omoizashi, “A Parody of the Five Chivalrous Commoners, a Cup of Sake from their Fans.” Shows the actor holding a number of pipes; a shakuhachi protruding from his back. Published by Yama-Ta, 2ic/1852. Extremely fine impression and colour. Minimal soil at bottom, otherwise fine condition. 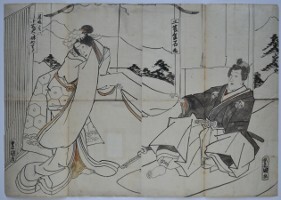 Signed Toyokuni ga.
An original hanshita-e (preparatory drawing) for a published diptych showing, on the left, the actor Onoe Kikujiro II as Tatsuhime – in reality Yawata, the younger sister of Kotoda. On the right is Iwai Kumesaburo III as Kudo Kanaishimaru. 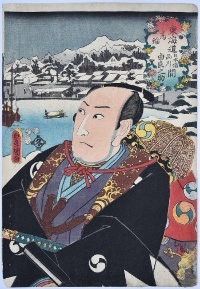 The play is Matsu icho Tsurukame Soga performed at the Nakamura-ya theatre, 1/1854. The publisher of the print was Sanoki. These first drafts by the artist themselves survive because a more detailed drawing was needed by the blockcutter, and this was normally given to an assistant to execute. Or the drawing was never taken up by the publisher, for whatever reason. Sumi and touches of red. Signed Toyokuni ga on both sheets. Sold “as is” with all imperfections. 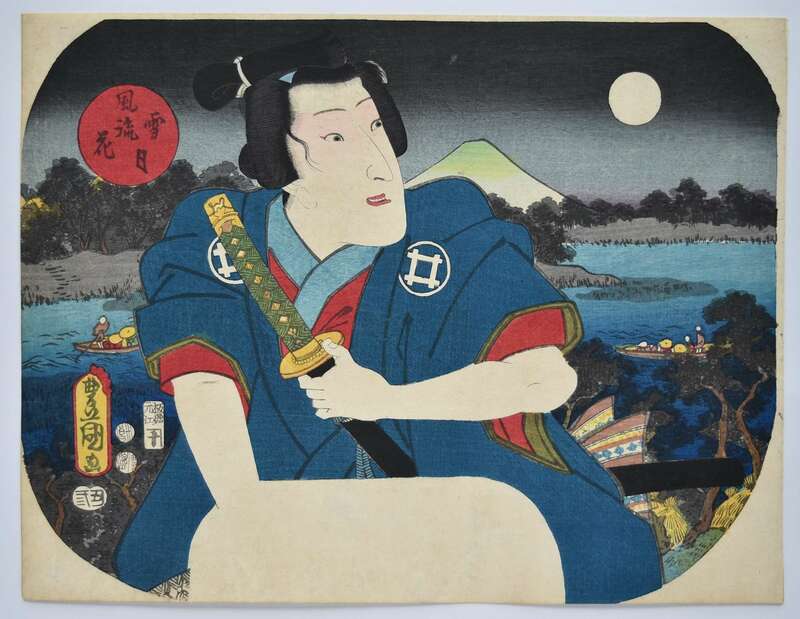 Moon from a set Furyu settsugekka, “A Fashionable Snow, Moon, Flower.” An uncut fan print showing the actor Iwai Kumesaburo III as Shirai Gonpachi. Kumesaburo last played this role in the play Kakitsubata tamuke no harakawado performed at the Kawarasaki-za theatre in 3/1850. Published by Kojima Jubei (who specialised in fans) in 3/1853. Very fine impression, colour and condition. Signed Toyokuni ga.
An exceedingly rare fan print showing a bust portrait of Ichikawa Danjuro VII as Soga no Goro wearing the iconic kuruma bun wig. 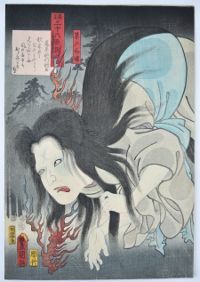 This famous story has many versions but basically it tells how Kawazu Sukeyasu was murdered by his cousin Kudo Suketsune. Sukeyasu left two sons and his widow remarried a man called Soga. He adopted the two children and they waited patiently for an opportunity to kill Suketsune which came when he was hunting near Mt. Fuji. They killed him but were themselves slain in the ensuing battle. 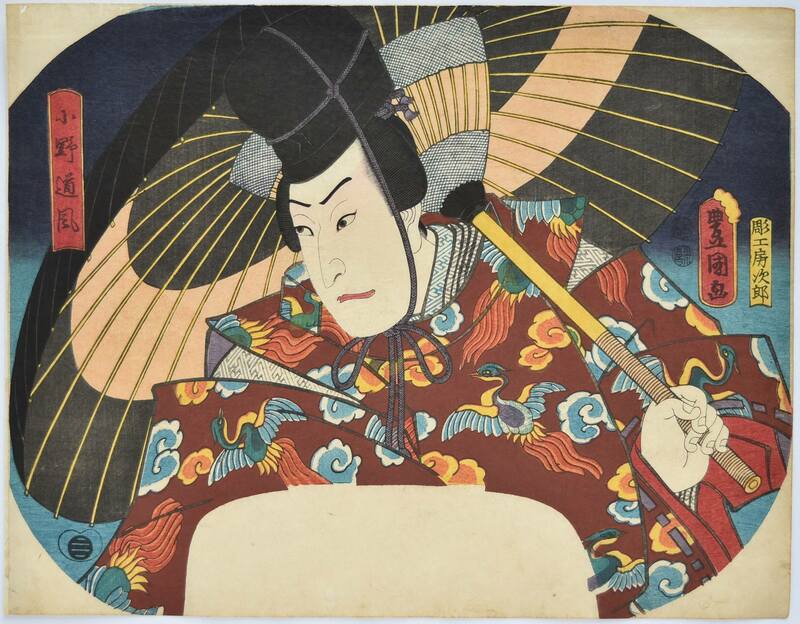 Published c.1827 by Maru-Mata, a publisher who seems to have only produced fan prints for a few years. Possibly Kunisada’s finest actor design in this format. A design I have never seen and probably unique. Very good impression. Good colour. Dismounted from a fan and sold “as is” with all imperfections. 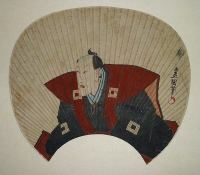 Signed Kunisada ga.
A long surimono showing a fan with an image of Ichikawa Danjuro VII as Soga no Goro in the play Yanone, “The Arrow Head.” To the left a fan shape with a poem by Sansho VII (Ichikawa Danjuro VII) and irises. Extremely rare. 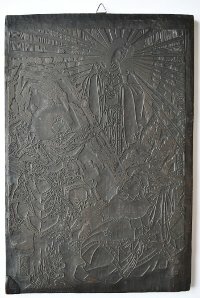 This impression sold by me in 1997. Issued c 1814. These long surimono were published with the poems attached but were invariably removed by collectors as being a distraction from the image. Very good impression and colour. Minor soil, otherwise good condition. Signed Gototei Kunisada ga. A name bottom left corner reads Onishi Tokuzo II. A complete setsugekka koban surimono-style set of triptychs: Snow, Moon, Flowers. 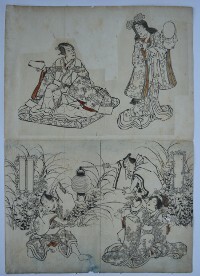 Each triptych shows actors in the snow (from left: Matsumoto Koshiro V; Iwai Kumesaburo II; Ichikawa Danjuro VII); in moonlight (Iwai Shijaku I; Bando Mitsugoro III; Iwai Hanshiro V); and admiring the spring blossoms ( Onoe Kikugoro III; Segawa Kikunojo V; Seki Sanjuro II). 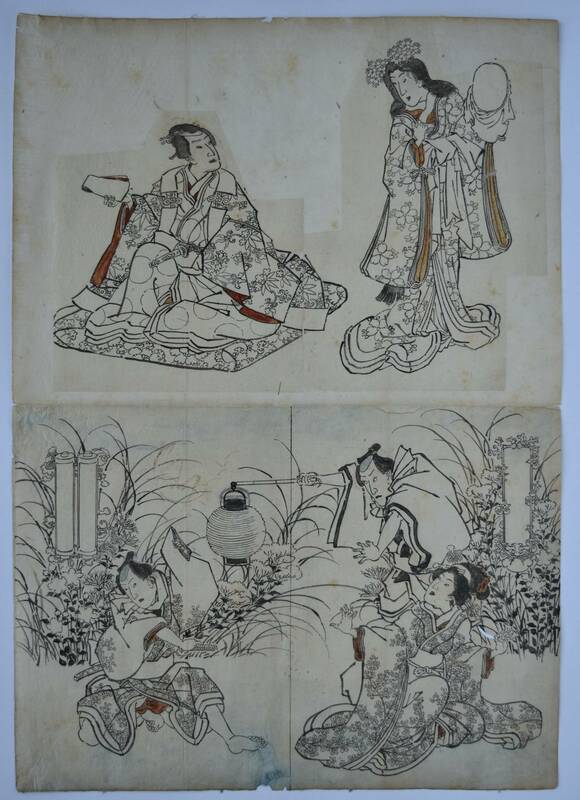 Published by Mikawaya Seiemon (who specialised in these koban surimono-style prints) c 1825. Extremely rare. One other complete set is in the Harvard Art Museum, acquisition numbers 206831; 207183; 207139. Very fine impressions. These are not true surimono, although they are listed in some books and catalogues as such. However, they are printed with the same delicacy with beautiful blind-printing. Fine colour. Small nicks out of the corners, otherwise fine condition. 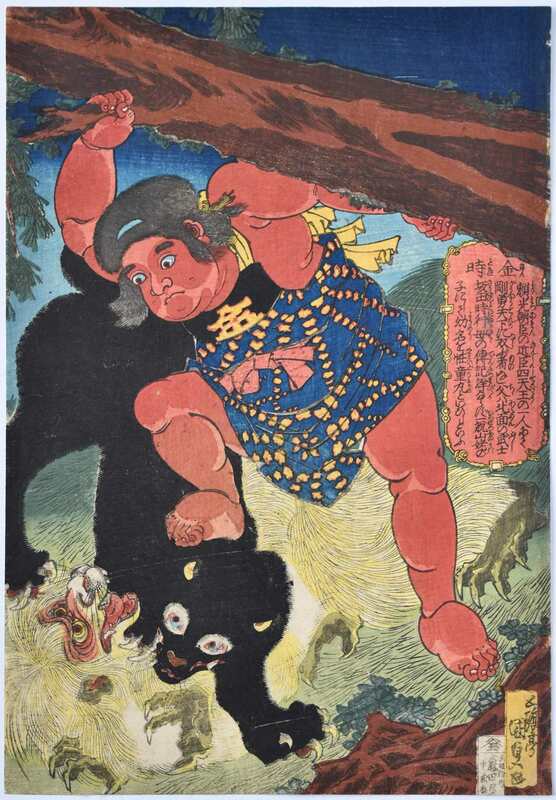 Each sheet signed Oju Kunisada ga.
Kaido-maru (Kintoki) with his forest companion, a bear-cub, attacking a giant white monkey. The chubby Kintoki is always shown red-hued and wielding a giant axe. In this case he heaves a tree above his head. Published by Moritaya Hanzo, c 1827. Rare. Very good impression. Fine colour. Slightly trimmed, otherwise very good condition. 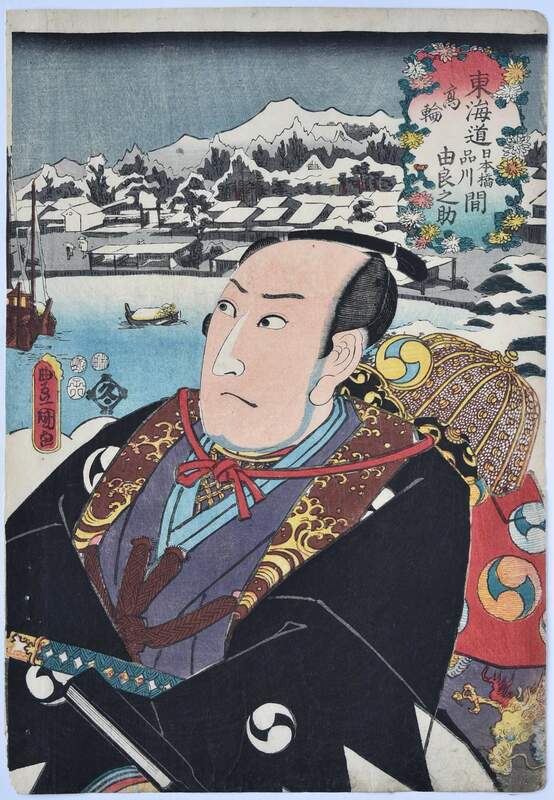 Signed Gototei Kunisada ga.
A triptych showing Mitsuuji, the romantic hero of the Inaka Genji (“A Rustic Genji”) accompanied by a beauty looking out across a snow-covered garden to where a group of girls are building a giant snow rabbit. Hiroshige and Kunisada collaborated on a number of these Genji triptychs in the 1850s and this is one of the most charming. Published by Moriya Jihei of Kinshodo, 12/1854 (and therefore probably in anticipation of the following year, which was a Year of the Rabbit). Fine impression. 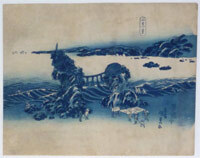 The early state with gradation behind the rabbit and bokashi on stream and in the sky. Fine colour. Fine condition. Signed Toyokuni ga on two outside panels and Yuki no kei oju, “Snow landscape by request” Hiroshige hitsu. The actor Ichikawa Danjuro VII as the medicine peddler in the play Uiro-uri and Ichikawa Danjuro IV in the votive panel above as Kagekiyo in the play of the same name. 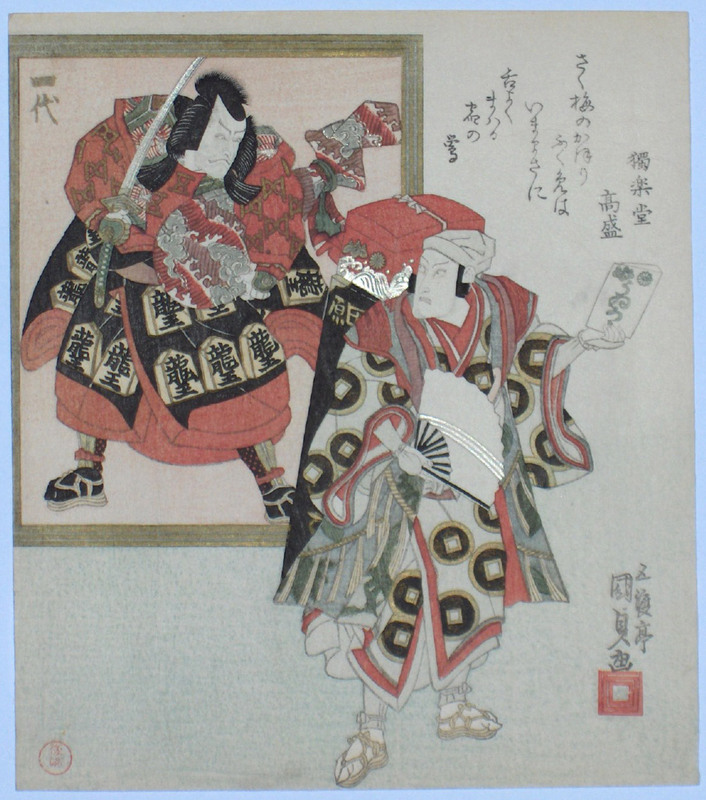 Both these plays are included in the Kabuki Juhachiban ” Eighteen Favourite Plays” chosen to illustrate the special art of the Danjuro line of actors. The lower half of Kagekiyo’s costume includes the characters “Dragon King” “Ryu-o” suggesting the date 1820. The upper half has the Gogawa hour-glass poetry club symbol. Very fine impression. Fine colour with gold and silver. Fine condition. Signed Kunisada ga.
Taira no Tadamori (1096-1153) grappling with the oil thief from a set: Honcho komei kagami, “A Mirror of our Country’s Renowned Heroes.” Published by Joshuya Kinzi, c 1835. The story relates how the Emperor Shirakawa was perturbed by a monster in the precincts of the Mido Temple at night. The samurai Taira no Tadamori was ordered to kill the beast only to discover a harmless old monk who steals a little oil from the stone lanterns. 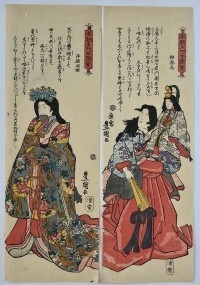 Kunisada designed a number of sets like this around this date. Fine impression and colour. Very slightly trimmed, otherwise very good condition. 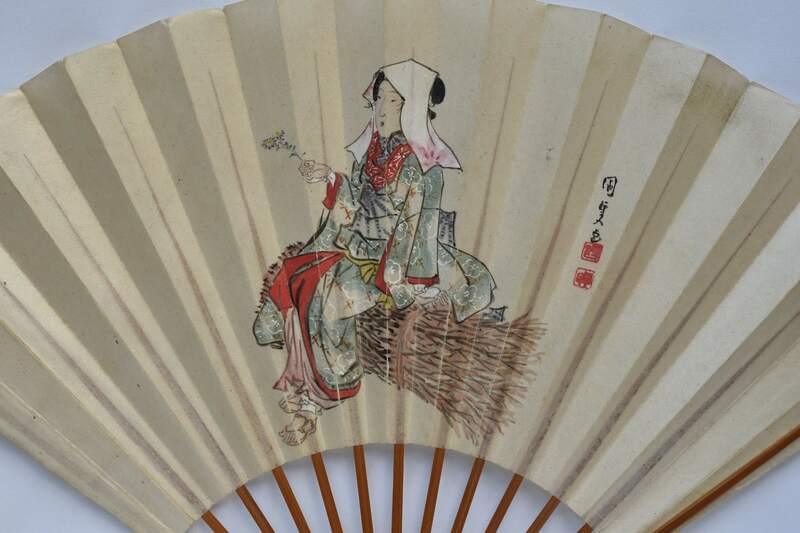 Signed Kochoro Kunisada ga.
An extremely rare set of hosoban designs: Pictures of Various Women of imperial Japan. 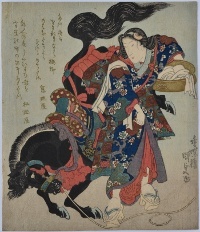 Shows, on the left, Princess Joruri – the lover of Yoshitsune. 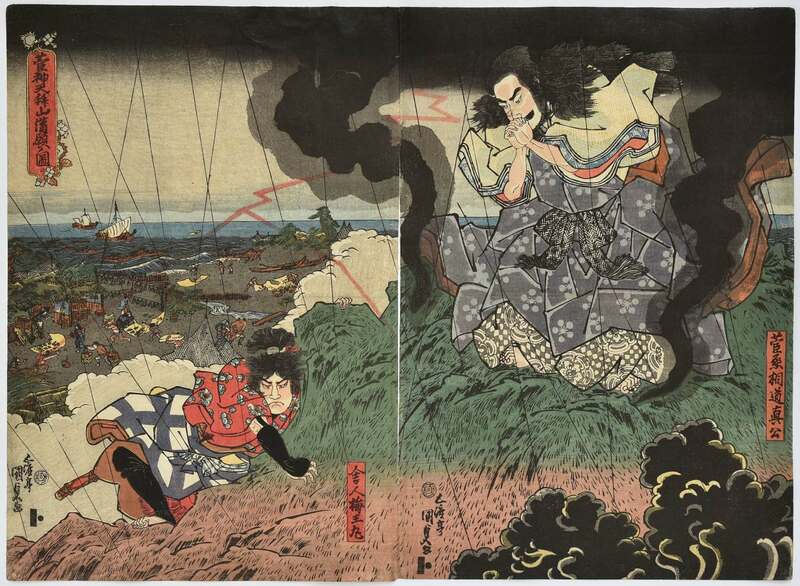 On the right Suke no Tsubone, the wet-nurse of the child Emperor Antoku who both drowned at the battle of Dan-no-ura in 1185. Published by Shimizuya Tsunejiro, 1845. Very good impression and colour. Small repaired wormage on each sheet, otherwise very good condition. 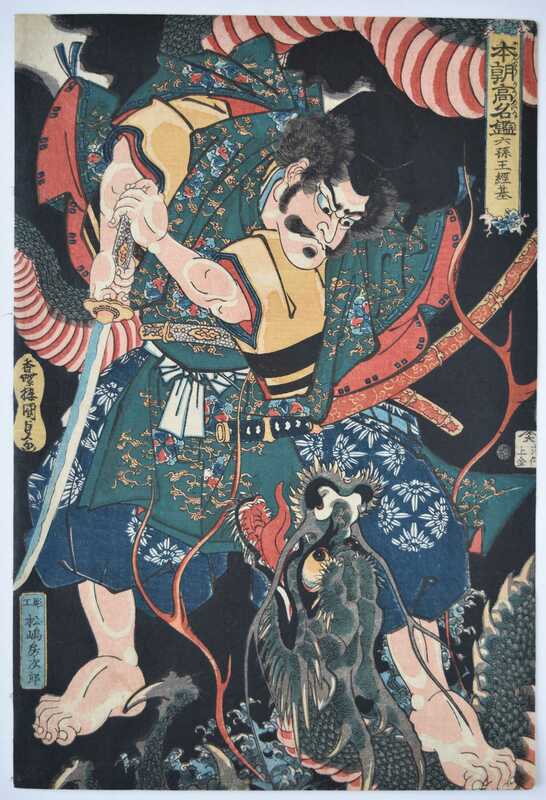 Signed Toyokuni ga.
An early warrior print showing Rokuson Okeigi (Minamoto no Tsunemoto [894-961]) battling a giant dragon. 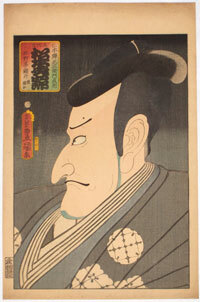 From a set Honcho komei kagami, “A Mirror of Our Country’s Renown Heroes” published by Joshuya Kinzo, c. 1835. Fine impression and colour. Slight trimming, otherwise very good condition. 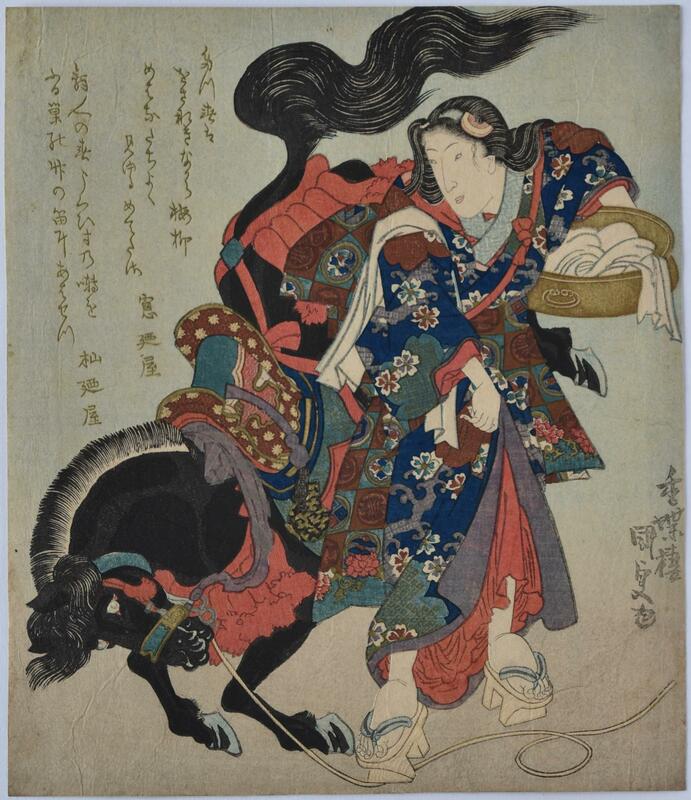 Signed Kocho Kunisada ga.
A surimono showing the strong woman of Omi, Okane, stopping a runaway horse from a temple by holding its tether down with her geta. Published for the year of the Horse, 1834. Fine impression and colour. Areas of gold and silver. Some slight crinkling, otherwise very good condition. 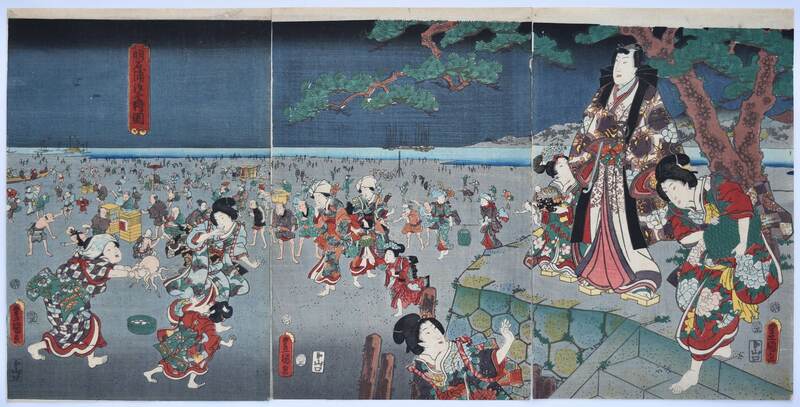 Signed Kochoro Kunisada ga.
A triptych showing Prince Genji (far right) on a stone terrace looking out at Suma Beach, Akashi, thronged with visitors enjoying themselves. Two of his party look as though they are going to collect shells. A mitate of Chapter XIII of the Genji Monogatari where Genji is exiled at Akashi, Akashi no ura shiogari no zu. There was a proliferation of sets based on the original Genji Monogatari and the Ryutei Tenehiko (1783-1842) update at this time. Published by Yamaguchiya Tobei, 1/1855. Fine impression and colour. Bokashi on the edge of the bay at top (missing on later editions). Fine condition. 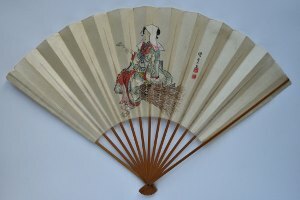 Signed Toyokuni ga.
An extremely rare and unusual surimono: I have only seen two impressions – both of which have passed through my hands, and one of which was gifted to the Rijksmuseum, Amsterdam. 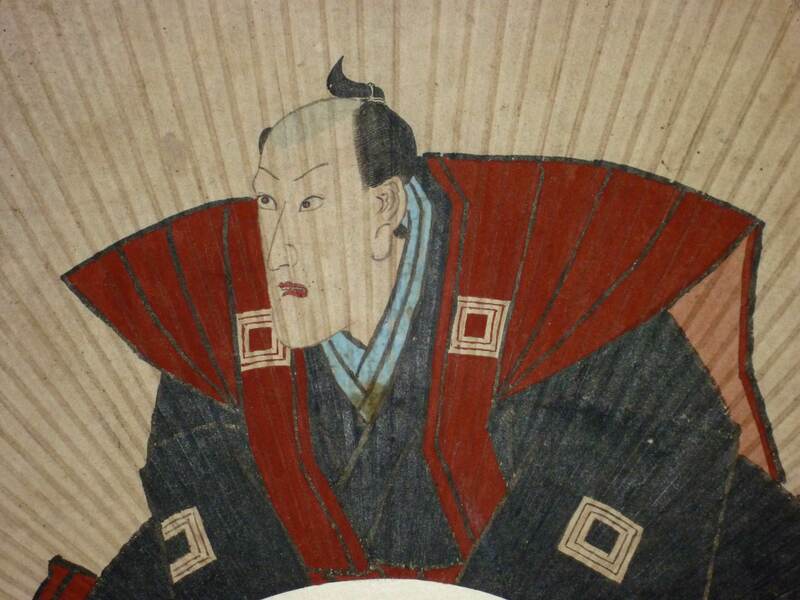 Shows the most famous playwright of his age – Tsuruya Nanboku IV (1755-1829). His crest is clearly visible on his shoulder. He died on the 27th of the 11th month, 1829 and this surimono must date from shortly after that: A sort of shini-e – very unusual in surimono form. He wrote the most famous Kabuki ghost story: Yotsuya kaidan, “Yotsuya Ghost Story” (1825) as well as the quick-change play Osome no nanayuki (1813). Fine impression and colour. The poems above printed in gold. Slight soil. Very small restored binding holes at left edge, and slight trimming at bottom. 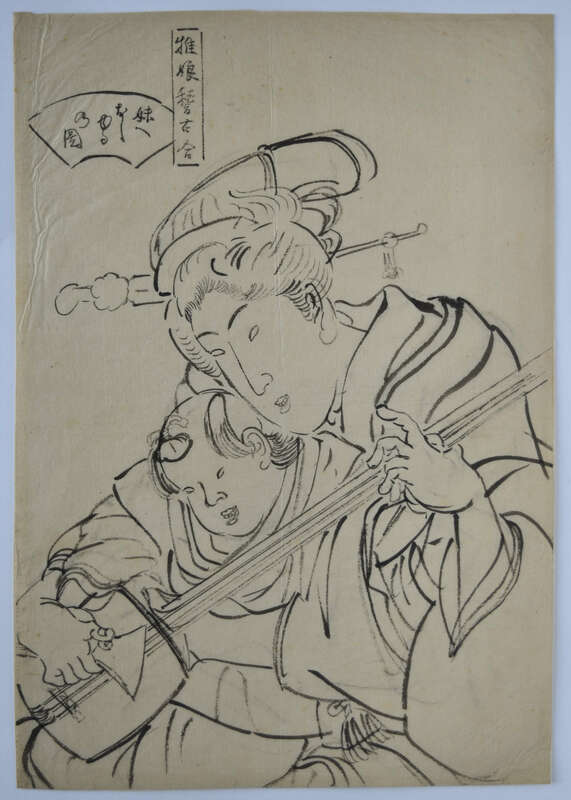 Signed Gototei Kunisada ga.
A rare diptych, Kansho Tempaizan mangan. 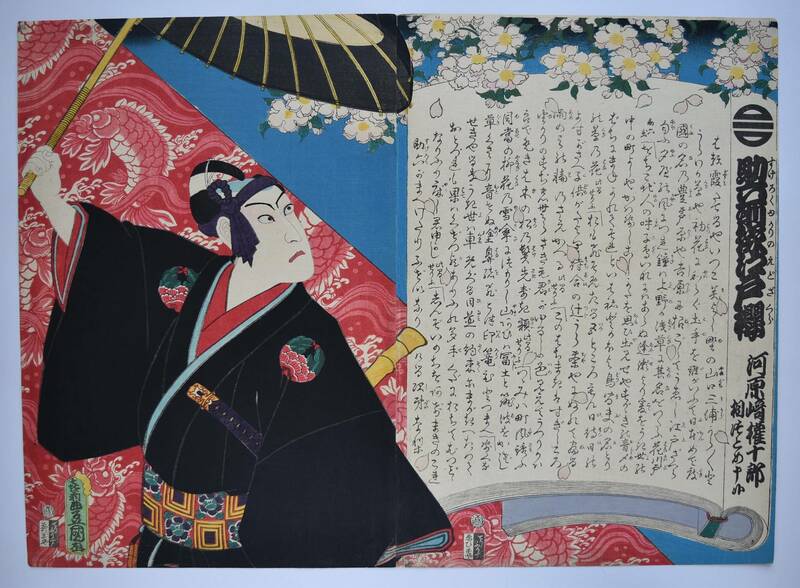 This famous tale (with different versions) is the basis for the play Sugawara denju tenarai kagami, “Sugawara and the Secrets of Calligraphy” which was performed at the Kawarazaki Theatre, Edo, 9/1832. This Mt. 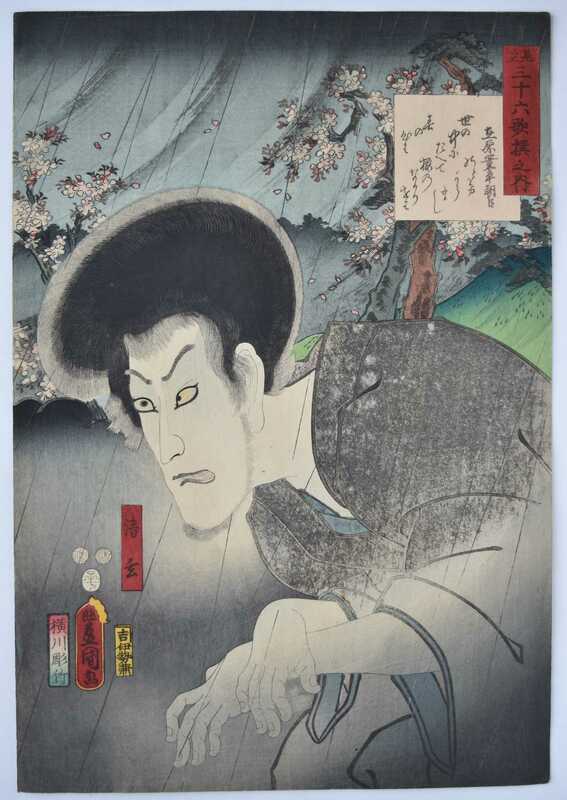 Tempai scene shows Kan Shojo (Sugawara no Michizane), a Heian politician and poet, transforming himself into a demon and invoking a storm. 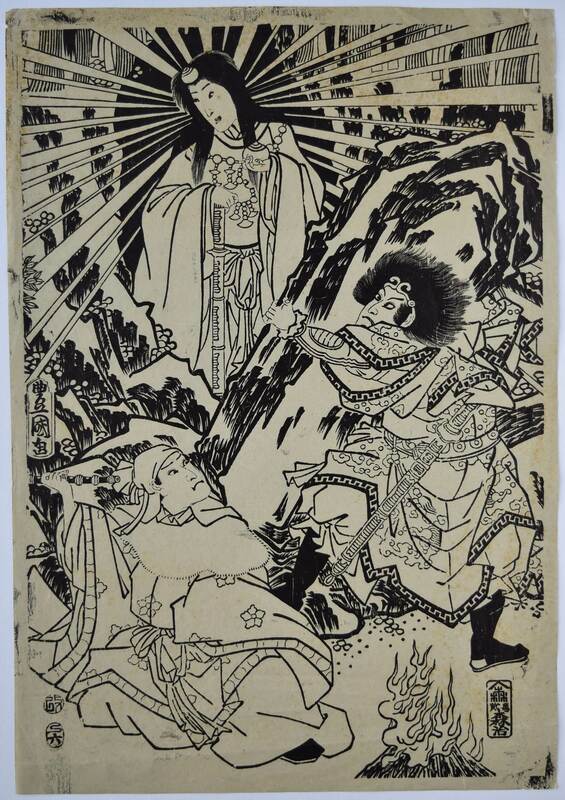 Umeomaru , a former retainer of Kan Shojo is seen climbing the mountain on the left sheet. 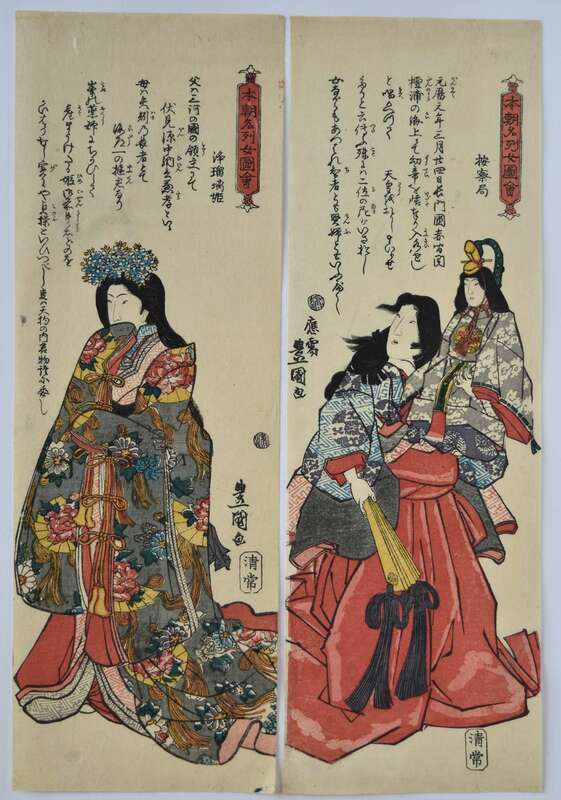 There is also a fine vertical surimono diptych of this subject issued by Kunisada in 1832. Published by Yamaguchi Tobei. A fine design I have not catalogued before. Fine impression and colour. Imperceptible centre fold, otherwise fine condition. 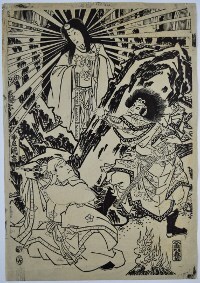 Signed Gototei Kunisada ga.
Narukami Shonin, a wicked priest, from the play Narukami. 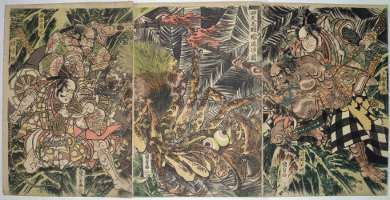 One of a set Toyokuni kigo kijutsu kurabe, “A Contest of Magic Scenes by Toyokuni.” The series published by Hiranoya Shinzo, 1862. The set is known for its deluxe printing. Superb impression and colour. Fine condition. Signed Kio Toyokuni hitsu (77 year’s old). Winter from a set of the four seasons showing Prince Genji and attendants in the snow-covered grounds of a palace. 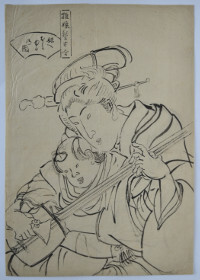 Published by Enshuya Hikobei, c 1849-50. Fine impression and colour. Slight trimming, otherwise fine condition. 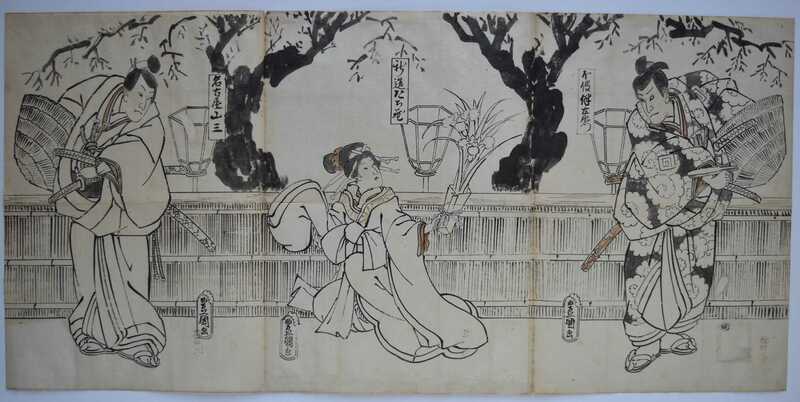 Signed Ichiyusai Toyokuni ga.
A triptych showing Mitsuuji, the romantic hero of the Inaka Genji (“A Rustic Genji”) accompanied by a beauty looking out across a snow-covered garden where a group of girls are building a giant snow rabbit. Hiroshige and Kunisada collaborated on a number of these Genji triptychs in the 1850s and this is one of the most charming. Published by Moriya Jihei of Kinshodo, 12/1854 (and therefore probably in anticipation of the following year, which was a Year of the Rabbit). Very good impression, colour and condition. 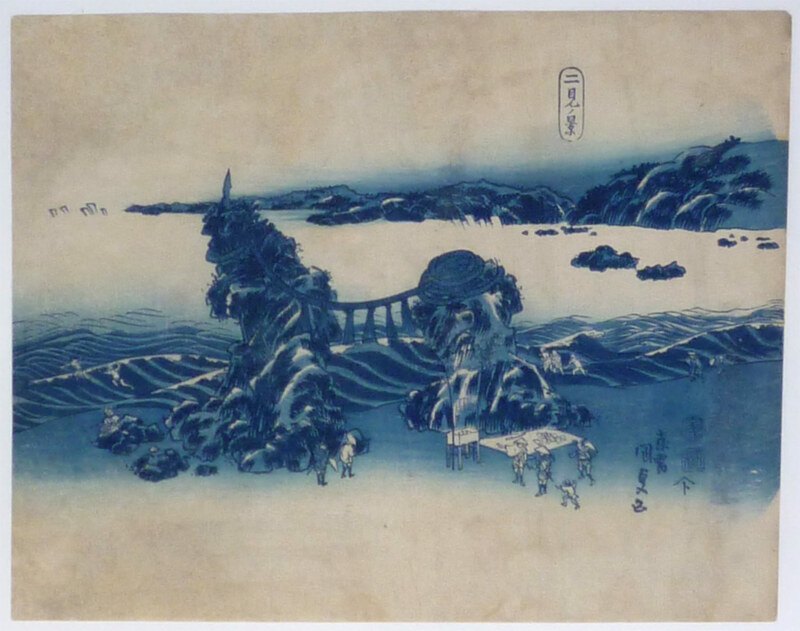 Signed Toyokuni ga and Yuki no kei oju, “Snow landscape by request” Hiroshige hitsu. 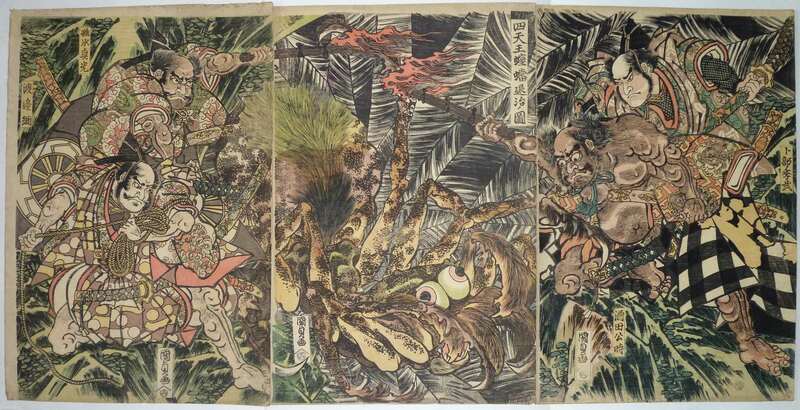 An exceptionally rare triptych showing Minamoto no Yorimitsu (Raiko) and his loyal retainers, from left to right: Watanabe no Tsuna, Usui no Sadamitsu, Sakata no Kintoki and Urabe no Suetake killing the giant “Earth Spider.” Numerous versions exist of this story but basically Raiko and his followers have to tackle various horrendous apparitions in a cave within the hill Kagura ga oka near Kyoto, eventually to be faced by a beautiful woman who envelops Raiko in cobwebs. He slays her and her body turns into the spider, the head being twenty-five feet long and eyes shining like the sun and moon. He cuts off the beast’s head and the carcase reveals the many bodies devoured by it. 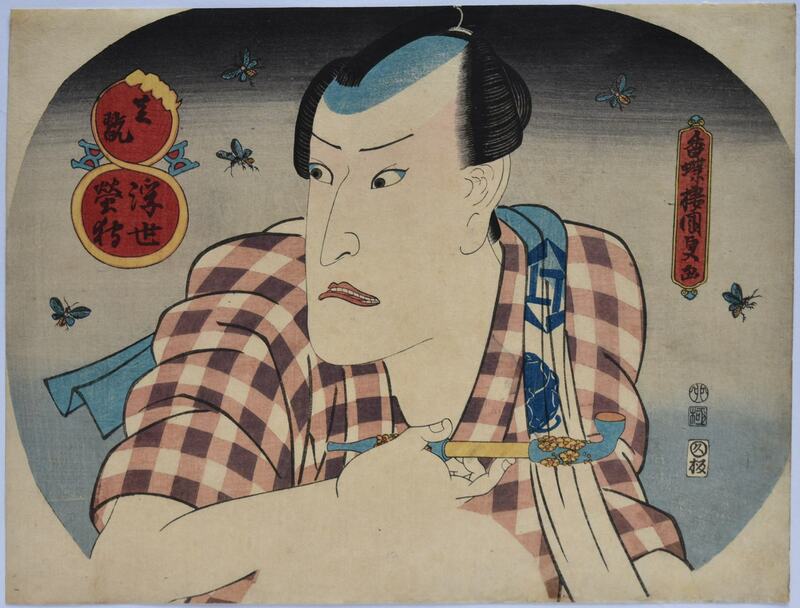 An extremely early Kunisada print published by Nishimuraya Yohachi, c 1815. I have not seen this design before or located another impression. Very good impression, colour and condition. Full size with extra paper around. Signed Kunisada ga.
An original painted fan showing the actor Danjuro VIII. 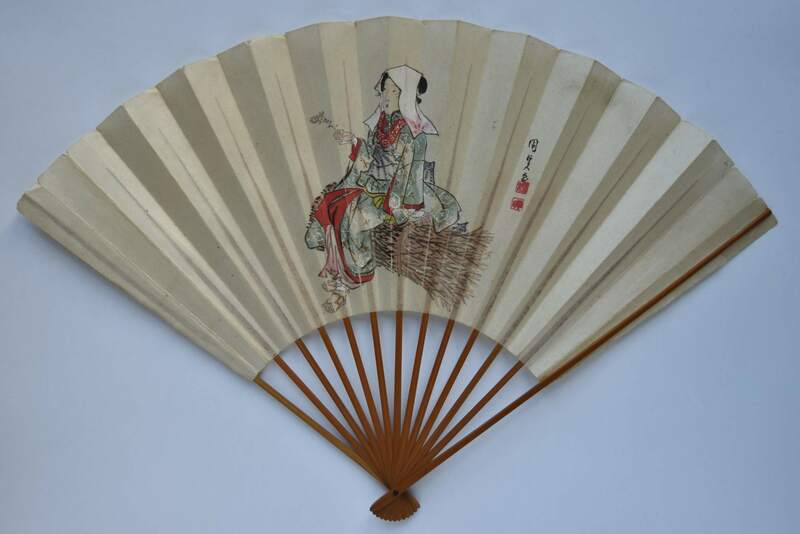 The fan has been used and dismounted from the frame and laid onto Japanese paper, hence the rib marks. Signed Toyokuni fude with red toshidama seal. Painted c 1858. Sold “as is.” Extremely rare. An aizurie fan print of the Husband and Wife rocks, Futami beach, Ise Province. A favourite beauty spot and a Shinto site showing the tasselled rope hanging between the two formations. From a series of extremely rare aizurie fan prints published 5/1830 by Daikokuya. Indeed, this may be the only known impression of this design. Very good impression and colour. 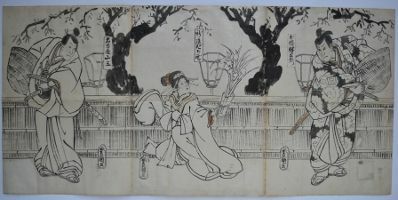 Restored and laid onto stable Japanese paper. 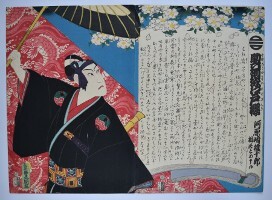 Signed Oju Kunisada ga ( “By special request” ). Matsumoto Koshiro V as the evil retainer Nikki Danjo who plots to overthrow his lord in the play Meiboku sendai hagi, “Precious Incense and the Bush Clover of Sendai.” From the last great actor set which was planned as a monument to his career and only used the most expensive materials. An untitled set with seventy-two prints completed on his death. ( One hundred and fifty were intended and some are in fact by Yoshitora. ) This is one of the best designs from the set showing a fine profile of an actor who was nicknamed Hanataka Koshiro, “Big-nosed Koshiro.” He made this role very much his own and to this day many actors still wear a mole on their foreheads in his honour. Published 1863 by Kinshodo. Very fine impression. Fine colour with extensive burnishing to the hair. On thick hosho and with the extra large margins of the first issues before being bound into albums. Slight soil at edge of margins, top and bottom, otherwise very good condition. 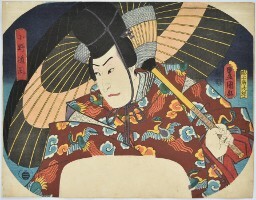 Signed Nanajuhassai ( “At the age of seventy-eight” ) Toyokuni ga.
An untrimmed aiban fan print showing the actor Nakamura Shikan II on an outing to view the summer fireflies. Ukiyo hotarugari, “Firefly Viewing in the Floating World.” Published by Ibaya Kyubei, 1831. Fine impression, colour and condition. 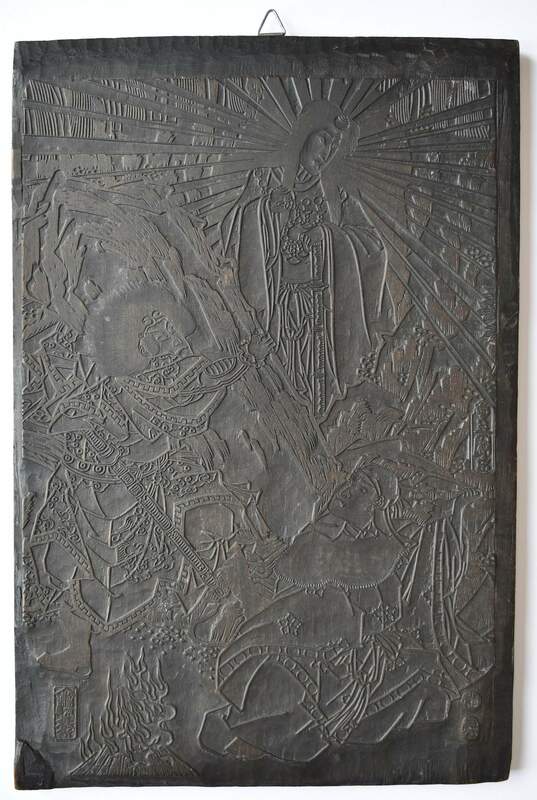 Signed Kochoro Kunisada ga.
An original woodblock for printing the centre sheet of a triptych showing Ame no Tajikarao pulling the giant stone away from the Ama-no-Iwato cave where Amaterasu (the Sun Goddess) had ensconced herself thereby depriving the world of light. The block cut by the publisher Moriya Jihei, 6/1857. The block in very good condition. On the reverse side is the yellow block. Sold with a modern pull from the block. 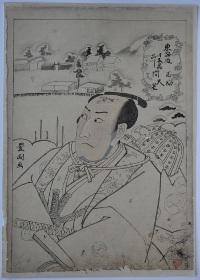 Signed Toyokuni ga.
A dai-oban print showing the actor Kawarazaki Gonjuro I (Ichikawa Danjuro IX) in the role of Hanakawado no Sukeroku, an otokodate (chivalrous commoner) in the play Sukeroku yukari no Edo zakura, “Sukeroku, the Flower of Edo.” This play was performed at the Ichimura Theatre, Edo in 3/1862 and this print was published by Ebisuya Shoshichi the previous month to advertise the play. The storyline is based after the exploits of Soga no Goro and was one of the Kabuki juhachiban compiled by Ichikawa Danjuro VII for the family repertoire. Fine impression with burnishing on the costume. Fine colour. Light album backing, otherwise fine condition. Untrimmed. 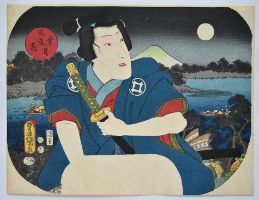 Signed Ki-o Toyokuni ga.
An okubi-e showing the actor Arashi Hinasuke I as Fujiwara no Shihei. 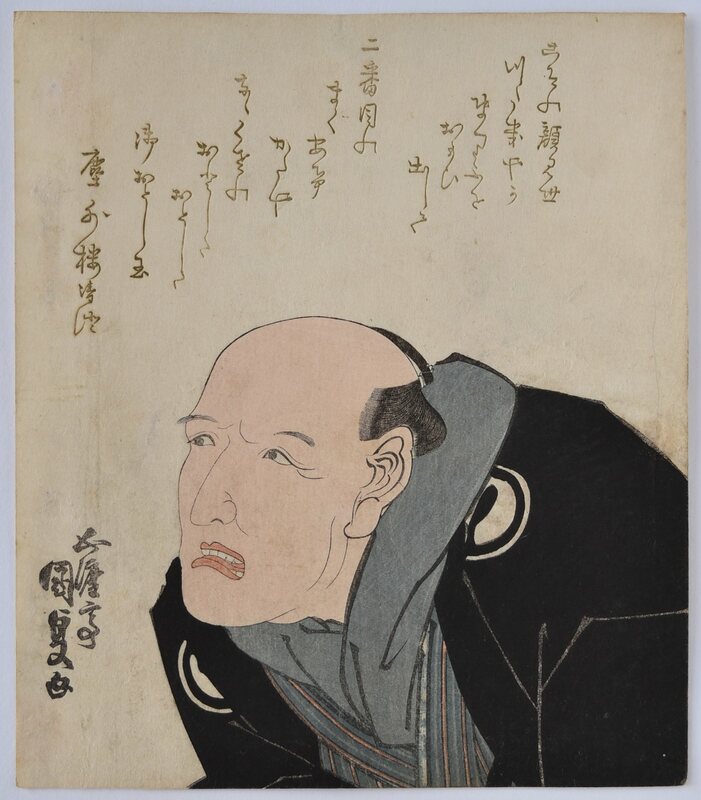 This was the Minister of the Left, the antagonist, in Sugawara denju tenarai kagami, “Sugawara’s Secrets of Calligraphy.” The set of “surimono-style” prints were published by Ebisuya Shoshichi between 1860 and 1869, the last 12 being by Yoshitora, and only 60 being completed by Kunisada before he died. The set is technically of the highest order and a fitting tribute to his life. 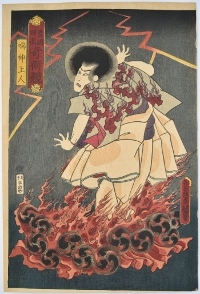 A vertical diptych showing the actor Onoe Baiko III in the role of the vengeful and disfigured spirit of Kasane above Sawamura Tossho I as her husband Kinoshitagawa Yoemon. From the play Kuruwa kruwa date no ooyose performed at the Ichimura-za theatre 1836. Published by Kawaguchiya Chozo, 1836. Extremely rare. Fine impression and colour. Very good condition. 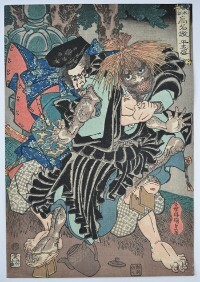 Signed Gototei Kunisada ga. 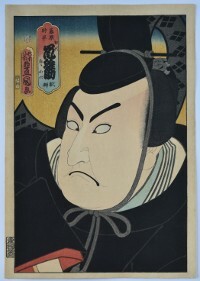 The actor Ichikawa Kodanji IV in the role of the vengeful and disfigured spirit of Kasane (Kasane no Bokon) from a set of prints Mitate sanjurokkasen no uchi, “An Imaginary Thirty-six Poets” published by Iseya Kanekichi in 1852. The relevant poet in this case is Fujiwara Toshiyuki no Ason. A rare 6-sheet design: Odori keiyo gakuya no zu, Odori keiyo nikai-iri no zu, “View of the Backstage and Dressing Rooms, Backstage at a Newly Opened Theatre.” The 1855 earthquake and resulting fire destroyed the Edo theatre district. Only five months later the first theatre – the Ichimura Theatre – was reopened. This print, issued the previous month, was an advertisement for the opening. A number of actors are recognisable by their mons. Published by Izumiya Ichibei, 1856, 2nd month. Very good impression and colour. Some trimming, otherwise very good condition. This design is invariably trimmed as the designs that have survived are from albums where the top triptych had to fold down into the album. Signed Toyokuni ga.
A preparatory drawing sold together with the published print showing the actor Sawamura Sojuro III as Oboshi Yuranosuke from the play Kanadehon Chushingura. 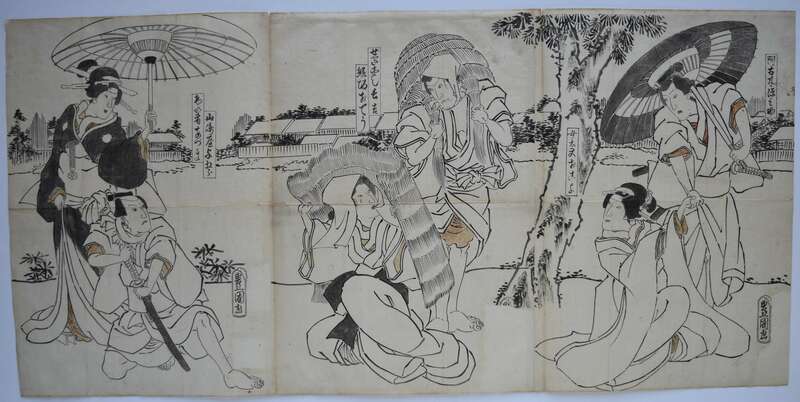 [Yakusha mitate] Tokaido gojusan tsugi no uchi: Nihonbashi Shinagawa no aide, Takanawa, Yuranosuke, “Actors at the Fifty-Three Stations of the Tokaido: Takanawa between Nihonbashi and Shinagawa, Yuranosuke.” The drawing is from a group of 43 that were sold by a Milanese gallery in 1981. The set was published by Takadaya Takezo in 1852. Seal bottom right of the collector Kaoen. 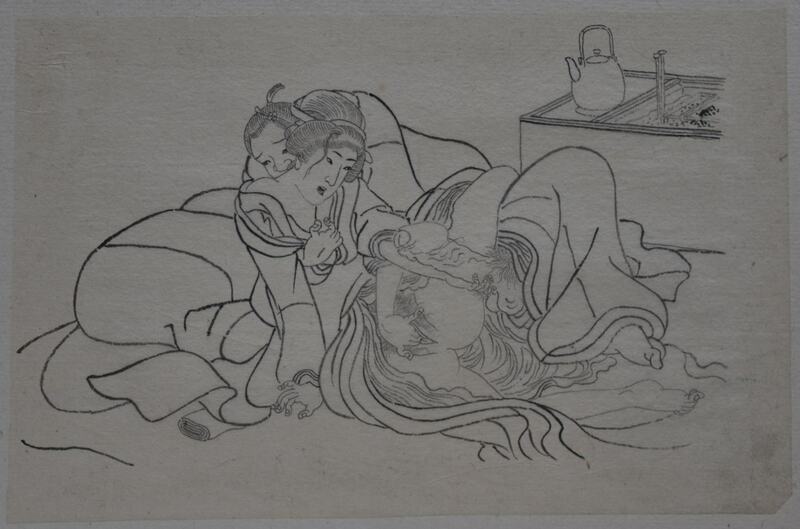 Three other drawings from this group are illustrated in Kunisada, Robert Schaap, Hotei Publishing, 2016, nos 103-105. The drawing is laid down (as all were), sumi with light red and blue to the face. There are numerous annotations indicating the colours to be used. There are some differences between the drawing and the published print, mainly in the background landscape. The print is in good condition. 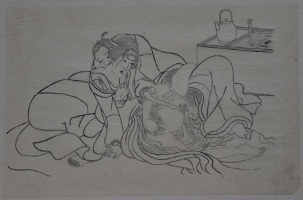 The drawing is signed Toyokuni ga.
A fine original shunga drawing showing a couple copulating. Probably a preliminary design for an obon illustrated book. Sumi on thin Japanese paper, 7.5 x 10.5 in, 19 x 26.5 cms. A nice example unlike the many poor unattributed examples available.